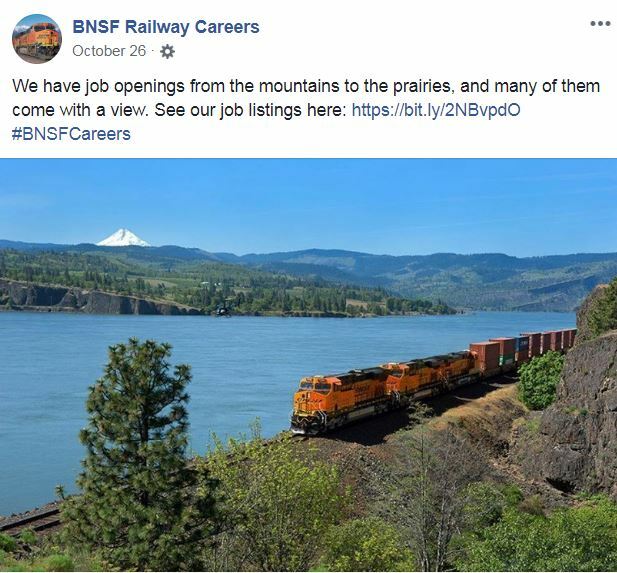 Like many companies in today’s tight labor market, BNSF Railway was having difficulty filling a significant number of job openings across the country. Available jobs were spread over 21 states with an average unemployment rate within those states of 3.8% as of February 2018. Jobs to be filled were largely skills-based trades such as electricians, diesel mechanics and engineers, and many were in smaller cities and less prominent parts of the country. Before developing a comprehensive marketing plan to solicit qualified applicants, Jackson did a deep dive into job descriptions and potential candidate profiles for key job groups. And knowing that recruiting often is a numbers game, media plans were strategically developed to achieve the reach and impressions required for sufficient applicant-to-hiring ratios. A well-established brand in a heritage industry, BNSF has spent more than 160 years developing its image and voice in the transportation sector. As an essential connector, safely and efficiently transporting freight from point A to point B, BNSF also has worked to be a trusted partner of the communities and people it touches along the way. To ensure trust was an essential element of campaign creative and implementation, BNSF officials effectively communicated brand presence, safety guidelines, and other critical do’s and don’ts during the campaign’s discovery process. Creating advertisements and social media content calendars for a months-long campaign requires a comprehensive body of assets. Pulling from a substantial set of existing BNSF images and video content, Jackson had the ability to develop campaign creative in a shorter amount of time, allowing the campaign to easily achieve the desired August launch date. BNSF is consistently identified as a top employer for U.S. military veterans. Because nearly one in every five BNSF employees is a veteran, campaign creative was designed to specifically engage veterans and transitioning servicemembers. Digital ads were delivered to the target audience using tactics such as geofencing around transitioning military recruitment events and job fairs and placing ads on unique websites such as rebootcamp.com. To complement paid media efforts, a quarter of social media posts created for the campaign were designed to educate and engage transitioning military. Understanding the locations of available jobs at BNSF helped Jackson’s media team home in even further on potential candidates. For example, many of the job openings were in rural communities with smaller populations where an available workforce did not exist. Knowing this, Jackson was able to focus the campaign more toward recruiting for specific types of jobs for which candidates were more likely to make a move. 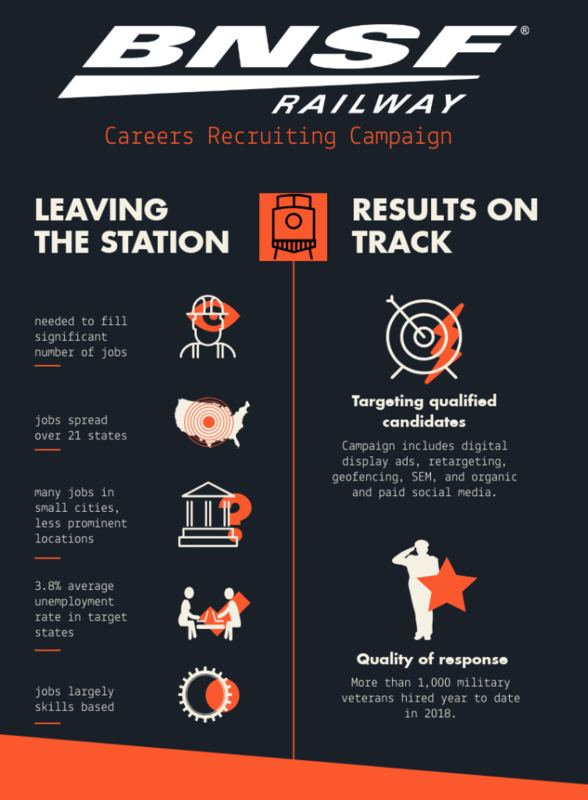 Metrics to date indicate that the campaign is achieving above-average results for applicant-to-hiring ratios, with the portion targeting transitioning military resulting in 1,000 military veterans hired year to date in 2018. Extensive research and well-defined target audiences on the front end, and campaigns sending prospective employees to a relevant landing page designed for conversions all receive credit for the campaign’s early success.